A lovely new friend, Brooke, invited me to join her and Jo's knitting group on Sunday; since we moved all of my "stuff" via uHaul to Anchorage on Saturday, it was a welcome respite to begin a project. I am making a hat for my granddaughter, Dareena, who will be 13 in August. The colorway is gorgeous - purchased yarn from Birch Tree Gallery in Soldotna where I met Brooke last fall. Below is a photo of the beginning of the hat rim that Brooke helped me with - very unusual cast on - YouTube with Cat Bordhi for Moebius Cast On done with a 47" needle - in essence one works from the middle out both sides until beginning the hat portion by casting off half of the stitches. Not sure which hat portion I am doing yet - considering "So You Think You Can Hat" on Ravelry. Unique moebius! 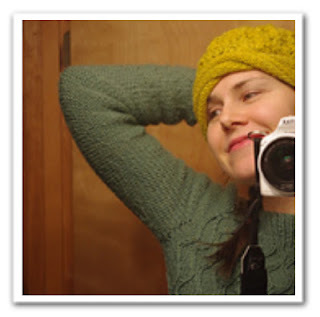 I included a photo of Brooke modeling the hat she knitted - actually it is her profile pic from Ravelry... smiles. Update: packing is almost done - a few items in the pantry and the refrigerator tonight and then I will begin unpacking Sunday in Anchorage. Returning to Kenai 17-19th to my part-time work. Thanks, Brooke, for your help! CatB is great! I adore the mobius cast on. Nothing a little knitting (beading, sewing...) can't make better!!!! I like that portrait, LOL! Cute pose! 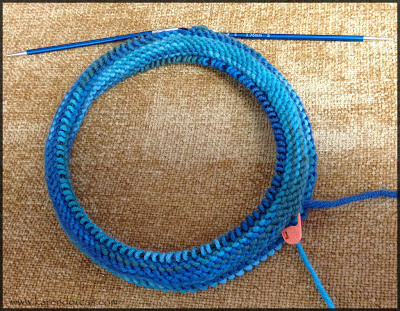 And the blue color of your yarn project is scrumptious. Hope the move goes smoothly for you! Great project, cute hat and blue will look gorgeous on our little girl. Did I tell you I need a headband for the days the wind is wild in CA? LOL. Glad to hear you are joining the Sunday knitting group. Love you lots. N.
Love the hat Karen!! And that yarn color is killer! Can't wait to see it finished. Knitting is the bond that keeps us sane-- especially when we have a little stress in our lives-- like moving. Good luck with un-packing my friend! Isn't it lovely to have an interesting new project to embark upon right in the midst of a bit of upheaval? Very settling at times.